“…This record really crosses all genres. ‘Short Are the Years’ is as country as can be, and then ‘Mercy, Can’t Go Beyond’ is adult contemporary with horns arranged like you’d hear on a Chicago song, and then the song we did with Gary LeVox, ‘Chose to Be My Friend,’ is a song my dad wrote back some time ago, but if you love Chicago and Journey, then you’ll like this song. It’s got that feel of the ’80s ballad, and so we kind of addressed that too. There’s a little taste of something for everybody on this. I just thank God that he allows us to address all of those things…” Jason Crabb, the high profile and respected southern gospel singer, who expanded his niche market and music genre into CCM in 2015 with the much popular and loved Reunion Records debut album Whatever The Road; is back with a brand new all new studio album, this time via Daywind Records, titled Unexpected. True to the album title, the record really is unexpected, as I never heard of the development and recording of a brand-new album from Jason, however this out-of-the-box album is surprising in a very good way. Though Jason has become famous throughout the years via recording southern gospel as part of The Crabb Family (from 1996-2007), and seemingly departed from gospel to record CCM in 2015; this new project marries the best of both worlds, as we are blessed to hear possibly Jason’s strongest and most cohesive project to date. Featuring a couple of power ballad anthem duets with Gary LeVox (“You Chose To Be My Friend”) and Kaya Jones (“Let It Be Love”) (which are a couple of my personal album favourites) as well as a cover written by Michael Boggs (“Short Are The Years”); Unexpected faithfully encapsulates a wide variety of genres, and still inexplicably sounds like Jason Crabb, so I guess for all of you guys who love southern gospel, you don’t have to be afraid or apprehensive of this new project. 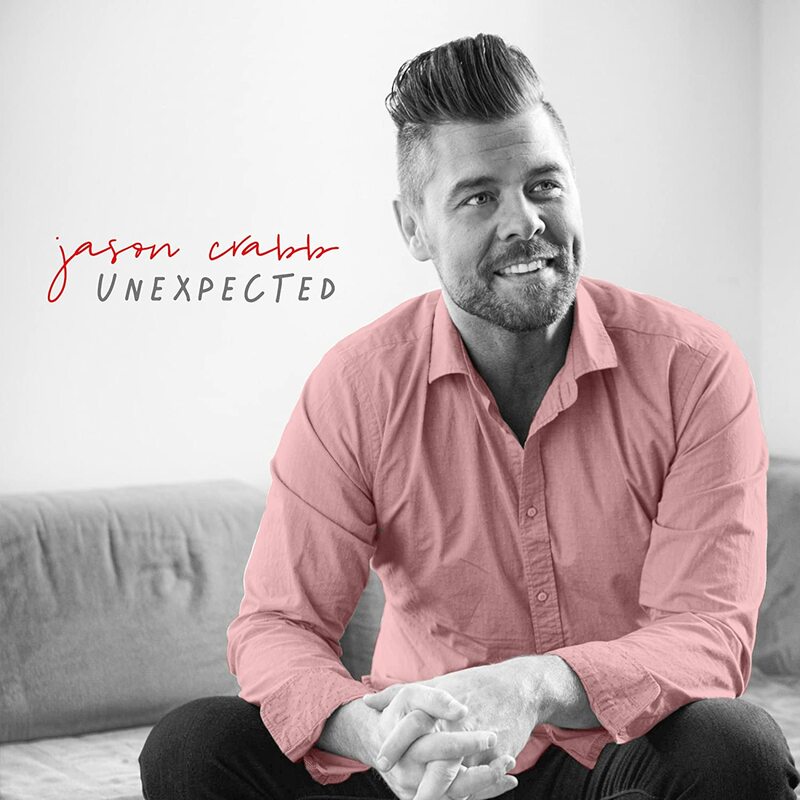 And even if you haven’t listened to gospel or country before, or The Crabb Family, or Jason’s previous solo work, Unexpected is well worth a listen, as we discover some well thought out melodies and praise Jesus because of who He is! Coming back to his roots in southern gospel, while maintaining his newfound love of CCM, Jason’s efforts in Unexpected need to be commended! So, let’s dive in to hear how well this project stack up to other standout albums in 2018, such as projects from Michael W. Smith (A Million Lights), I AM THEY (Trial And Triumph), ZEALAND (LIBERATED), Hawk Nelson (Miracles) and Sanctus Real (Changed). Opening the album with the somewhat prophetically titled “Expect The Unexpected”; the album opener is a left field rocker that we’d expect a band like Third Day, Carrollton or Rhett Walker Band to record. Yet Jason pulls this off brilliantly and with ease, as he ardently reiterates that every day and all the time we shouldn’t really expect anything with God- He works outside the box because that’s who God is. Once we think we’ve figured Him out in how He moves, God does something different just to prove to us that His plans are way higher and greater than ours. Employing an enthusiastic and vibrant gospel choir as backing vocals, with a spontaneous free worship interlude at the end of the track for added depth; “Expect The Unexpected” sets the tone for the rest of the album, as we are taken on a musical journey like no other, through various musical genres, each of them uncannily recorded by Jason to great professionalism and aplomb. “Day One”, fittingly titled, is a slow paced electric guitar led ballad, that has Jason fervently highlighting that he wants God to ‘…take me back to day one, where you drenched my heart in the water, I found love for the first time, breathe life into these weary lungs, so take me back, take me back to day one…’, a declaration that he wants to be more real and authentic with God, in comparison to how he was living before he knew Jesus (similar in theme to Matthew West’s “Day One”, in that every day is a day to start anew in our walk with God! ); while nostalgia is the name of the game with the 70’s themed brass and horns prominent adult contemporary melody “Mercy We Can’t Go Beyond”. Super catchy yet also heartfelt and honest, Jason inspires us with his emotional delivery of the ever true lyrics, especially in the chorus, as he belts out ‘…we can’t go beyond Your mercy, we can’t go beyond Your grace, there is no darkness that is greater, that can keep us from Your ways, we can’t go beyond forgiveness, we can’t go beyond Your love, there is no greater hope that we can rest upon, than the mercy we can’t go beyond…’, a sentiment I gladly want to echo as well, as we marvel at the endless qualities of God, especially His mercy. “Short Are The Years”, not written at all by Jason, is a thoroughly emotional, honest and hopeful country-infused melody, with the banjo and other acoustic guitar-like instruments at the forefront. As Jason highlights to us “Cinderella”-by-Steven-Curtis-Chapman-like lyrics, he reiterates that we all need to spend time with our loved ones, and cherish each day as they come, because ‘…short are the years, they go by in the blink of any eye, babies grow up in no time, you turn around to pick them up, but they’re not here…’ (and we may never know what will happen even tomorrow, so I guess you should treat every day with your loved one like your last! ); while jazz/blues brass instruments led 70’s/80’s throwback “Washed By The Water”, the album’s first single, is a big ball of fun and infectious joy. As Jason passionately lets us know that it is only Jesus Christ that can make us whole and clean, he inspires us all as he shares the undeniable fact that we are made new when we are washed by the water aka the Holy Spirit. “He Made You”, one of my favourite songs on the album, is as CCM as they come, and speaks about how much God loves each of us, so much so that He places people in our lives to impact us and change us for the better. People like a spouse, a best friend, and parents, siblings, the chorus is vague in that respect that we don’t know who the ‘you’ is, however it is the chorus that hits me hardest the most, as Jason confidently cries out that ‘…He was thinking about a broken man while He was working on a crazy plan, when rock bottom found me on my knees, I’m holding the living proof, He took his time and He thought this through, He knew exactly what I’d need, He was thinking about me when He made you…’. The penultimate track “Love Will Have The Final Word” brings the tempo back up again, as we are met with a rock/jazz epic collision and infusion, and Jason having a blast, declaring that Jesus will have the final word in the respect that He has won the war between Himself and Satan; while acoustic guitar led hymn-like contemplative and reflective ballad (with no verses or chorus- just one continuous refrain! )- “The Love In Your Heart Knows The Way” ends the album with a bang, as we are treated to a full on worship anthem with a stirring and ardent gospel choir, with Jason singing out that Jesus’ love in our hearts will point the way in which He wants us to go in terms of our life and in terms of us loving His creation. Yet it is the two duets “He Chose To Be My Friend” and “Let It Be Love” (with Gary LeVox and Kaya Jones respectively), that resonate with me the most, that I reckon are THE songs to listen to if you were to only listen to a couple on the album! Exquisitely led by piano, “He Chose To Be My Friend” was previously recorded by The Crabb Family, yet this version, a stirring, poignant, 90’s-influenced and ridiculously contagiously catchy duet with Rascal Flatts frontman Gary LeVox, blows the original recording right out of the water, with Gary and Jason singing in harmony perfectly- there are seriously Avalon vibes here, as the duo passionately sing out thanks to God because ‘…You went the extra mile to prove Your love was true, You held out Your hands as they drove the nails in You, when You could have walked away and turned Your back to all my sins, for me You gave your life, You chose to be my friend…’. While piano led CCM ballad “Let It Be Love”, featuring the guest vocals of former Pussycat Dolls member Kaya Jones is another winner, as Jason sings beautifully with Kaya, and once again lets us know that it is Jesus’ love that helps us be better people, and point those around us to our Father, Creator, Saviour and Friend. Relevant and also inspiring, both “Let It Be Love” and “He Chose To Be My Friend” will be in my iTunes playlist for a long, long time, and hopefully they will be in yours as well! “…We are called to love one another. We aren’t called to fix one another. We aren’t called to do all those things. We are just called to love one another, help one another, lend a hand and shut the door to hate and all those kinds of things. Those are some of the things I just wanted to scream. I just really feel called to tell everybody, ‘Come on, let’s lay the hammer down and let’s love each other…” As the official follow-up to Jason Crabb’s first album on Reunion Records (not including the 2016 hymns project Treasures: Timeless Hymns And Classics; Jason is anything but new to the CCM industry, and he has shown us once again his durability, and versatility as an artist, as well as his undeniable passion for Jesus. Unexpected may not contain tracks that are as punchy or breathtaking right off the bat, however it nevertheless shows us that these songs can and probably will be durable and timeless in the future, given that Jason is singing about eternal biblical truths, and also because Jason creates such a powerful presence vocally no matter what he sings. With Jason on this album excelling at almost all the genres presented to him (especially “He Chose To Be My Friend” and “Let It Be Love”); Unexpected is a release that we all need to listen to, to be reminded of the everlasting power of Jesus’ love. Well done Jason for such a musically different yet impacting album. Can’t wait for the next full-length studio album of all original songs, whenever that arises!